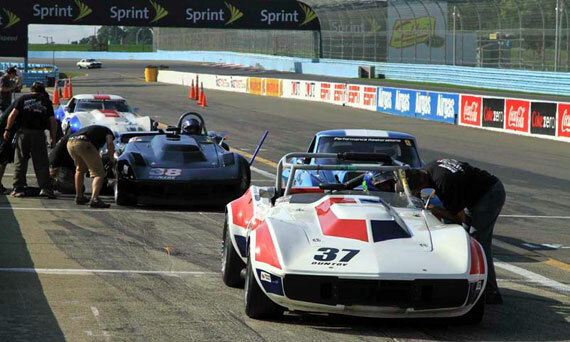 After having won the Mitty in the Duntov #38 car at The Mitty, and the Road America International Challenge with Jody O'Donnell in the #46 car, the Duntov Team looked to win all three of the 2012 major National vintage races at the U.S. Grand Prix at Watkins Glen. There was only one thing left to do, and that had never been done before, by anyone — Beat Peter Klutt! Klutt's car has been the center of controversy since it first appeared at the U.S. Grand Prix in 2005. 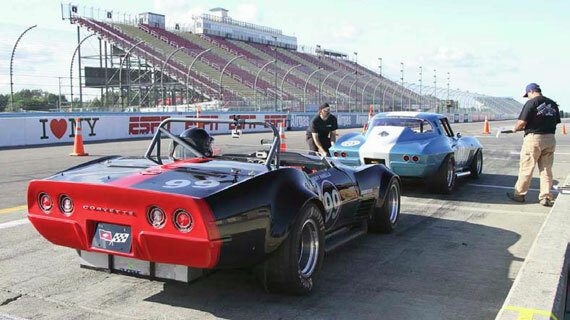 Klutt featured the build of the car in two episodes of his national TV program, Dream Car Garage. Whereas most Group 6 production cars at the time were old racecars tuned up for vintage racing, Klutt's car was built from the ground up to dominate in vintage racing, and dominate it did. Since that first race in 2005, it won every race it finished. Klutt always made it look easy, finishing just ahead of the second place car, which in recent years was often one of Klutt's customer cars. 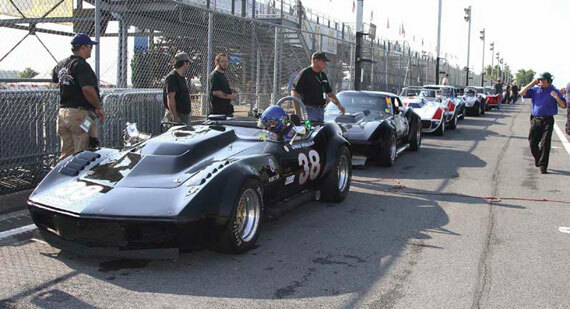 In last year's U.S. Grand Prix, Klutt qualified with a 2.02 when he had to run hard against Edward's #38 car, but when Edward broke a valve spring on the out lap of the Qualifying race, Klutt ran only 2:05's to again take the checker, with a small-block Corvette second and his 427 Cobra replica teammate finishing a close third. In 2010, Duntov Motor Company built the #38 car to compete with and to beat Peter Klutt. Such was the singular purpose of the car that we christened it KK1, for Klutt Killer. 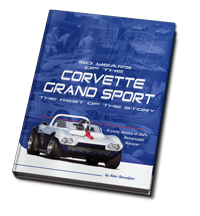 We bumped into Peter Klutt at the SEMA show in Las Vegas in November 2009 and told him what we were planning. Not surprisingly, he was both gracious and confident. He said he welcomed the competition, and of course we did as well. We needed Peter Klutt as a goal, and although he wouldn't admit it at the time, he needed some competition. There was a widespread opinion in vintage racing that Klutt had been sand bagging by winning everything by only a few car lengths, while running just fast enough to make it look real. 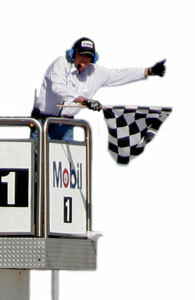 The 2012 U.S. Grand Prix would be Duntov's biggest trackside service challenge. We brought 5 cars from Texas and met a 6th at the track. From our shop we had in addition to Edward's #38 KK car we had Jodie O'Donnell's #46 car, Clair Schwendeman's #37 car, Tony Parella's #99 1971 Corvette car as well as Tony's classic 58. We also agreed to provide trackside service for Brent Jarvis's mid-year big block coupe. Thankfully, it was a weekend of almost no mechanical issues. This year's U.S. Grand Prix started on Wednesday, a day earlier than usual. We used most of Wednesday and Thursday test sessions to bed brakes and tires. Hoosiers need to be scrubbed when new after which they cure in the trailer for 24 hours before competition. We scrubbed three sets of tires on the #38 car on Wednesday and Thursday. Clair and Brent stop by for service as Klutt and Edward look on. Qualifying was set for Friday morning, and the Duntov cars went to the grid an hour ahead of schedule. When you are going for the Pole, qualifying is all about finding clear track. With our 5 cars occupying the first 5 places on the grid, the plan was to run a slow out lap to maximize the space behind the field. We ended up getting two unobstructed laps, while Klutt who took to the track behind the field, only got one. That turned out to be crucial, as Edward qualified with a 203.1, with Klutt a tenth back in second. Jody was third with a 2:06.3, while Clair was 8th, Tony 21st, and Brent Jarvis had an engine going south and qualified 23rd. We had waited two years for this first head to head battle with Peter Klutt, but in the Qualifying race it was no contest. Edward led every lap with a fast lap of 2:02 flat verses Klutt's 2:02.7. Jody finished third. Last turn, first lap, Qualifying race - and that's how they finished. There was a surprise weigh in for the top 5 cars after the Qualifying race, and Edward was 12 lbs underweight (two gallons of gas). Fortunately, SVRA has a 3 % margin for error, so we were clear by 75 lbs! Friday evening's traditional run through the City of Watkins Glen was not affected by a late afternoon storm. 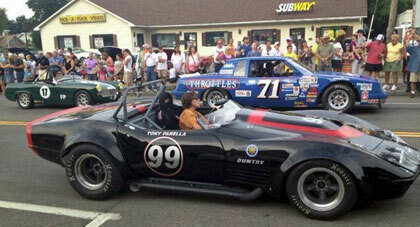 Tony and his daughter ran the event in his 58 while Lyn St James drove Tony's #99 car. Lyn really impressed the Duntov team with her professionalism and her charm. What a great lady! 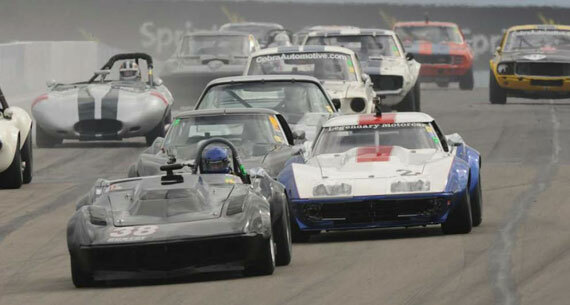 It pretty much rained all Saturday morning, and SVRA cancelled the Group 6 sprint race. 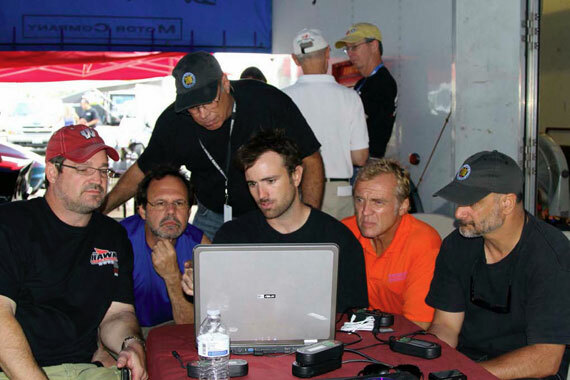 The Duntov drivers huddled with Edward as he conducted the Traqmate dot races to help the group find lap time. Saturday afternoon's Enduro was run in an intermittent light rain. Clair asked Alan to start the 90 minute race and the plan was for Clair to take over at the first of the two mandatory pit stops. Again the Group 6 production based cars were the slowest group in the field, with a former Audi R8 LeMans racer setting the pace. A half dozen Group 6 cars ventured out onto the damp track and Alan brought Clair's 68 in after 40 minutes under green flag conditions with the lead. 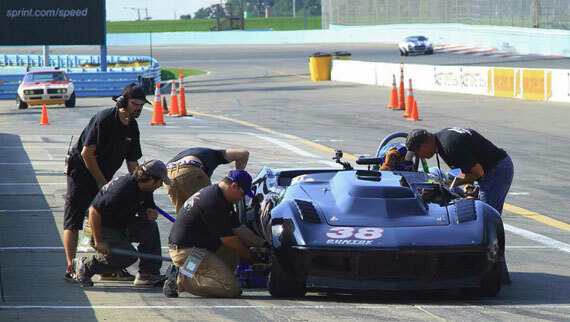 It is way easier to race than to watch someone else race your car — Clair counts down to the driver change! Clair took over only to suffer a flat tire two laps into his stint. He had to limp back to the pits with a shredded left rear tire, but the Duntov crew changed the tire and topped him off with fuel making that stop the second of our two mandatory 5 minute stops. Unfortunately that stop was under green just like the first one, and shortly after Clair rejoined the race a full course yellow flew, which allowed everyone who needed a pit stop an excellent time to put at least a lap on those who had pitted under green. To Jeff and Alan, it looked like the blown tire would end any chance of winning. We knew it was over when the pace car went out to bunch up the field, but incredibly the pace car waved Clair by and he was able to hustle around to the back of the pack and thereby unlap himself. When the circuit went green, Clair was on the same lap as the leader but about a mile behind with only 10 minutes to go. Thanks to our radio link, the crew on pit wall was able to motivate Clair to run down and pass the leading Group 6 car on the last lap for a well deserved class win! Edward and Jeff urge Clair on — he passed for the lead on the last lap! Sunday was the main event. Winning the Qualifying race didn't matter anymore as again Edward and Klutt started side by side from the front row. Since there was a weigh in on Friday, we were fairly sure SVRA wouldn't weigh us again on Sunday, but of course Klutt knew that too. We had to assume he would take some or all of his ballast out of his car, and of course we had that option as well. Instead we decided to add weight, so in the extremely unlikely event we were weighed again we would be good. We understood the race was going to be 20 minutes plus 1 lap, so we added enough fuel to run 22 minutes with enough left over to make up for the earlier 12 lb shortage. The Group 6 big iron takes the green flag and approaches the braking zone for turn one. It turned out they didn't weigh us, and the race was only 10 minutes plus one lap; so at the end of the race we were heavy by about 40 lbs. Edward won the race, in spite of the extra weight. Edward broke the lap record with three consecutive laps under 2:02, and a fast lap of 201.4. Klutt was way faster on Sunday as well, with a fast lap 1.1 seconds faster than he ran on Friday. Every lap Edward ran was faster than Klutt's lap, so the gap steadily grew to 3.2 seconds at the checker. Andre Ahrle in a Klutt prepared customer car finished 3rd, 29 seconds back. Jody just missed the podium finishing 4th. He had made a last minute decision to run some used Goodyear rear tires in the race, and that proved not to be the hot setup. Clair got stuck behind traffic and motored home 14th, with Tony close behind in 18th. Tony had just bought SVRA and had been the center of a crowd the whole weekend. He was constantly hounded by magazine representatives, reporters, TV and radio interviewers as well as competitors, well wishers and other hangers on. He never had a chance to concentrate on racing his car, so he was at a huge disadvantage. He said the next time is going to be different! We won all three of the major national vintage races in 2012. 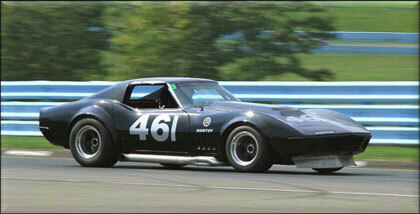 2013 will be the first year of the SVRA Vintage National Championships. I can't think of a more appropriate goal.